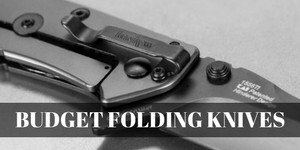 For many this topic may be a no brainer, you’ve been in the game a while and have seen and handled the different locking mechanisms so you know how to close a pocket knife. However, if you’ve never handled a modern pocket knife with all the fancy new locking systems you may not know, and there certainly isn’t anything wrong with that. But, let's not leave you in the dark any longer. I’m going to go over all the different knife lock types and explain exactly how to close a pocket knife using each one. The slip joint lock is the easiest to close, just by applying pressure on the back of the blade you can close this type of pocket knife. In general this type of lock is used on a classic style folding knife, such as Case Knives or an Old Timer. I would not recommend a knife that utilizes this lock type for anything heavy duty. Since there isn’t really a lock that holds the blade open, it will close with any type of downward pressure on the blade. For example, if you stab a block of wood any upward force that may be applied by your hand can be enough to close the blade when the tip hits the wood. If you’re not careful, you could potentially lose some digits. This lock is also pretty easy to operate, but let me explain what a frame lock is and also how to close it. A frame lock is just like it sounds, a portion of the outside frame is used to hold the blade in the open position. This occurs when the blade gets to a fully deployed state, then the frame pops in behind the back of the blade preventing it from being closed. When you’re ready to close the blade, with your thumb you simply push on the frame part that is positioned behind the blade and that allows you to then close the blade down back into the handle. Once you get used to a frame lock, one handed operation is pretty simple and very quick. A couple popular pocket knives that use this type of lock would be the Kershaw Cryo and the CRKT Drifter. Liner locks are similar to frame locks, but rather than a part of the outside frame holding the blade open, a part of the inner liner pops in behind the blade tang to hold it open. So what is the liner you may be wondering, it’s the metal part of the handle that the outside scales are attached to. The scales are machines out of different types of materials like G10 or FRN and are then attached to the liner via torx screws a majority of the time. When the blade is deployed, the liner moves into place behind the blade preventing it from closing down accidentally. When you’re ready to close a liner lock knife, on the bottom side of the handle you will see where the liner is set behind the blade tang. With your thumb push the tab of the liner toward the outside scale. Once completely free of the tang the blade is now free to close. This lock can also be easy to operate with one hand with some practice, however if you’re new to knives I would recommend using both hands until your comfortable. A popular liner lock knife that I would highly recommend would be the Spyderco Tenacious. How a lockback knife works has a little more ingenuity built into it. Along the top of the handle is a metal spine that has a part that locks into a notch on the back of the blade. Pressure is applied to the spine by a spring that helps the spine locked into the notch preventing the knife from closing unexpectedly. This is a nice video that shows exactly how the lockback mechanism works. This is a very strong and safe lock, however it can be a bit difficult the operate with a single hand. With the lock on top of the handle, you have to reposition your grip to reach it which isn’t easy and can be potentially dangerous if you accidentally drop the knife. Watch out toes!!! When you are ready to close the knife, there is a finger cut out on the top side of the handle that lets you press down on the spine. This retracts the spine from the notch cut out of the blade and allows it to close. It can be done, it's just a bit clumsy at first and takes some practice. If you’re interested in a lockback knife, the legendary Buck 110 is a fine example. The AXIS lock is the chosen lock for Benchmade Knives, it was of course invented & patented by Benchmade so that is no surprise. It is truly a simple, yet incredible design and I find it to be my favorite lock. It works with Omega springs and a solid bar running the width of the handle. As the blade is opened, the bar is pushed forward by the spring onto a cut out shelf on top the blade tang. The spring holds tension on the bar not allowing it to slide back and thus not allowing the blade to be closed. When a user is ready to close the pocket knife, simply slide the bar back and when the bar clears the blade tang shelf it’s now free to close. The Benchmade Griptilian is one of many Benchmade knives that employ the AXIS lock, the Griptilian is a highly popular choice when it comes to everyday carry knives. The compression lock is kind of similar to the liner lock, meaning they both utilize the liner to lock the blade in place. However, there implementation is quite different, and better executed in the compression lock in my opinion. With the compression lock its now locked & unlocked on spine of the handle. As the blade opens the liner pops into place on a cut out shelf on the topside blade tang. Taking it a step further there is also a stop pin that the liner rides between. Since the lock is now on the spine of the handle this makes the knife much stronger and than that of a standard liner. It's also safer to operate as you never have to place your fingers in the blade path to close it. Here is a nice video that details the differences between the standard liner lock and the Spyderco compression lock. 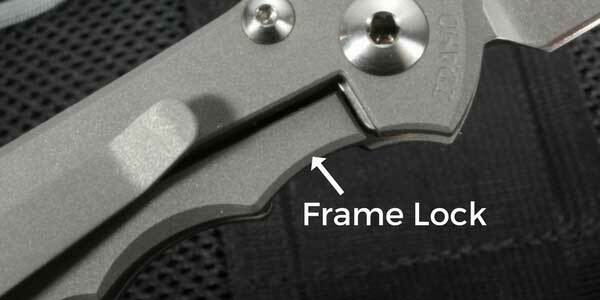 How to close a pocket knife that uses a compression lock? It’s similar to the frame & liner locks, you can push the liner towards the scale of the handle to release the blade to be closed. A popular knife that utilizes this lock type is the Spyderco ParaMilitary 2, which is considered by many people to be one of the best pocket knives money can buy. These are just a few of the more popular locking mechanisms used in pocket knives today, there are of course more and I will probably expand on them in the future. But for now, if you’re unfamiliar with how these standard locks operate, then you may not know how to open and close a pocket knife and I hope this article as helped you out. Of course if you ever come across a knife that has a lock that isn’t listed here and you can't figure out how to close a knife, you can always shoot me a comment below and I’ll do my best to explain the inner workings of it.